Happy Sunday! I’m in Evanston for a quick trip to support the Kellogg 5K for Kids, which I helped start last year at Kellogg and which supports kids with cancer through an amazing and empowering summer camp. It’s such a wonderful organization, and I’m so grateful to my friends at Kellogg that are continuing the tradition, so I wanted to be sure to come support them. I’ll be sure to post lots of pictures to Instagram, so be sure to follow along! As I was packing up for the airport yesterday, I made sure to bring a bunch of healthy snacks. It was about a 9-hour ordeal to get to Chicago (because I’m too cheap to buy a direct ticket and used Southwest points!). 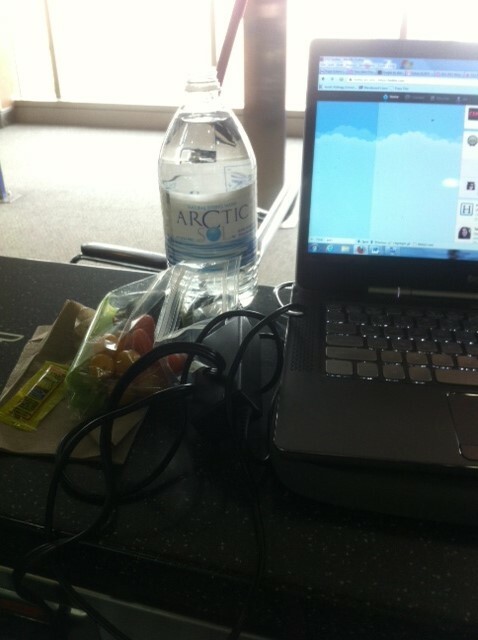 Sure, I could have scoured the airport for the healthiest options (and I have plenty of tips on how to do so! ), but I wasn’t familiar with the airport in my layover city (Kansas City), and I wanted to take advantage of all the fun and delicious snacks I had at home already. So here’s what I brought (clockwise from left): baggies of cucumbers/ celery/ grape tomatoes/ baby carrots/ bell pepper, a handful of cherries, a breakfast cup of cottage cheese + berries that somehow made it through security, Gimme roasted seaweed snacks (a new find for me – I liked them! ), Ian’s Cookie Buttons (OK, not the healthiest thing in the world, but I love them and wanted to have several options for my often-raging sweet tooth so I didn’t hit the candy in the airport! ), a protein bar (see below for recommended options), and two chocolate avocado cookies (I tweaked the recipe from Sprint2thetable’s blog, but my tweaks weren’t perfect so I’d recommend using hers if you want to try them!). All of this gave me plenty of choices for whatever mood I was in, and kept me happy throughout the day. It’s slightly light on the protein and healthy fats, but it sure beats getting too hungry and eating whatever I could find in the airport (which would probably be overpriced, not as delicious, and not as healthy)! This is just one example of the loot that I brought with me on yesterday’s trip, but now I want to share my top 7 healthy travel snacks. Enjoy! Veggie packs. My #1 tip for getting in more veggies! Most veggies will be just fine unrefrigerated for a few hours. For some extra flavor, look for individual cups of hummus (less than 3 oz each so they go through security), or grab some mustard or salsa from a restaurant in the airport like I did yesterday. I used to bring leftover roasted vegetables on planes, but Kev almost killed me – they do NOT smell great on a plane! So stick with the raw veggies :). Fruit. Go for fruit that isn’t super hard to eat and holds up reasonably well with a few bumps in your carry-on bag. I like grapes, cherries, apples, and nectarines for traveling. Protein bars. As always, I’d prefer to get my protein from whole food sources, but it can be tough to do that on the road. For travel, I love Garden of Life Organic Fit bars, No Cow bars, Rx bars, Vega bars, or Tanka bars if you are a meat-lover (if you get jerky, be sure to get good quality!). “Chip Impostors.” If you find yourself craving something salty, it can be hard to pass up that giant bag of chips you see at the newsstand. Instead, pack a single-serving bag of Popchips, a package of seaweed snacks (I usually get SeaStix Annie Chun’s or SeaSnax), or some freeze-dried fruits or veggies. They’re a great way to satisfy your cravings in a healthy way! Nuts/ trail mix/ nut butter. I love traveling with individual portions of almonds or trail mix without much added sugar. I know from experience that it’s tough for me to limit my portions when I’m eating out of a big bag of trail mix (and even healthy snacks should be eaten in moderation! ), so I try to stick to single-serving packages (like these). I also bring single-serve packets of nut butter to squeeze onto fruit/ celery for some healthy fats, or just eat straight up in an “emergency”! I love 90-calorie packets of Barney Butter, or Justin’s maple almond butter for a special treat! Collagen. I find it tough to get enough high quality protein while traveling, so I bring packets of collagen like these with me on most trips. See this post for the benefits of collagen! Greens powders. I need a boost of extra immunity while traveling, so I’ll always bring Organifi packets, Amazing Grass packets, Vega Protein & Greens, or Juice Plus+ chewables. A great way to get a little flavor, get me to drink more water, and fight off any passing sicknesses! I’m trying to stick to 7 tips for posts like these (as I did in my 7 tips for a healthy Memorial Day post), because it’s my favorite number and it feels manageable. But here’s a bonus tip … WATER. If you do nothing else while you travel, please drink a ton of water! Flying is very dehydrating, and we can often mistake thirst for hunger. I drank a full liter on each of my two flights, and still felt the need to chug a liter on my drive into Evanston. If you don’t want to pay an arm and a leg, bring an empty bottle through security and fill it up at the water fountains. Whatever it takes, just drink! 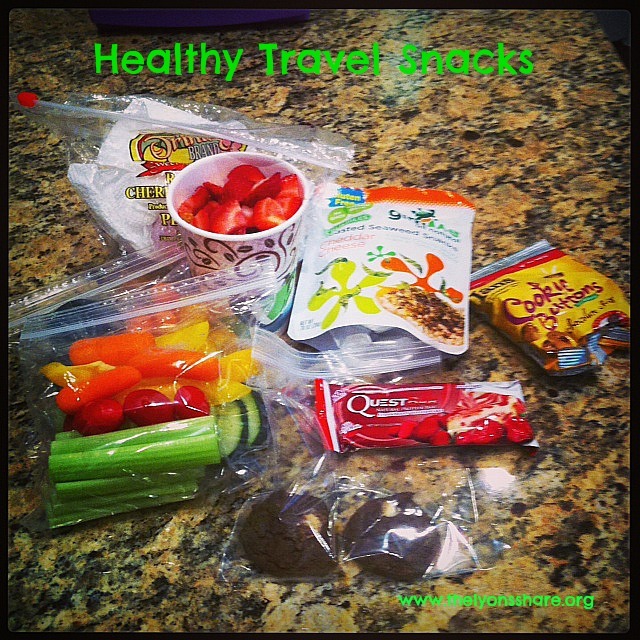 So tell me in the comments … what are YOUR favorite healthy travel snacks? I really like the idea of filling an empty water bottle once you’re through security. I’ve heard that it is not a good idea to drink water from the plane as bacteria is a BIG problem. ( unless you are lucky enough to be in first class where they serve bottled water). And you listed some great snack ideas too! I also like edamame chips that I bought at Trader Joes, but you have to “repackage” as the bag has many servings. Love the edamame chips, that’s a good suggestion! … you must have been with a great shopper when you picked those out ;). awesome tips:) 🙂 will be doing some of the same for my road trip! Oh good! GOOD LUCK on the trip … such an exciting time! The amount of top quality content material in your extraordinary website has truly made me understand the authority your website has. Mind blowing posts and articles seemingly everwhere. Maintain up the good function….